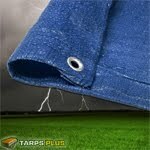 Due to the devastating events in recent months tarps have become essential product to have on hand. As everyone who has seen the after effects of hurricanes in Louisiana, or the Tornadoes that have ravaged the Midwest can attest, these items are indispensable. There are a few good reasons why you need to have an ample supply of these on hand. What happens when a natural disaster occurs is that buildings become susceptible to the weather. Natural disasters and inhospitable temperature, rain, and wind can cause damage to existing structures and this makes it impossible to quickly erect a new structure. When this sort of timely construction is not possible it is imperative that you have another more viable means of protecting your goods, materials and belongings. This is why tarps are so essential. There are any number of method which you can use but the main component of any of these will involve using a tarp. If you are in an area devastated by tornadoes such as we have seen in Joplin then it is in your best interested to always keep these material on hand. When a natural disaster strikes it can be devastating. One of the ways which you can protect your belongings and proper in the aftermath is to use one of these products. The tarps are lightweight and an inexpensive method to keep your belongs safe and secure. The devastation in Louisiana, Joplin, and many other ares shows how important it is to be prepared. Take the recommendation of the emergency professional and stock your home with these items. They will be incredibly important when the time comes. It is in your best interest to get a tarp and make sure that you have it handy in the event that you need it. These items are not expensive and can be a saving grace in the event that some form of devastating natural event occurs. Take the time and get one right now. As you have seen, countless reporters and newspapers have suggest that these items are indispensable and should be kept on hand in the event of a calamity.